Are you ready for a close encounter with fabulous skin? Since FOREO started shipping UFO smart masks across the globe, beauty fans have been raving about the results and asking about the availability of the app. Fear not glow-addicts! UFO app just launched on Google Play Store while the iTunes App Store version is sitting pretty waiting for the go-ahead which should be confirmed by April 18th 2018, latest. Clip your UFO mask into place. One short press automatically activates the Make My Day Treatment. A second press activates the Call It a Night Treatment depending on the mask you choose. Gently glide UFO across clean, dry skin and massage the formula in using circular motions until the device turns off, indicating the end of your treatment. Dispose of the mask and rinse UFO under running water. Enjoy the glow! Press and hold the ON/OFF button for 3 seconds to pair UFO with our FOREO app. Full white light appears when UFO is paired. Follow instructions to clip mask in place and scan the mask barcode. The corresponding treatment will automatically sync to your UFO device. How do I download the APP in English? It only downloads in Korean. Hi there! The English version of the app has been submitted to the App store – we’re just waiting for its approval to go through! Unfortunately, it’s out of our hands but we expect it to be live any day now. I unable to register to start my ufo mask, pls provide correct APP to download, my location is Singapore. Hi Angela, The UFO app has been submitted and will show up in your app store once it has been approved – unfortunately, it’s out of our hands right now, but we hope it will be live for everyone this week! So, may I ask which app should I use to register as a Hong Kong customer? Hi Jasmine 🙂 Right now, the China FOREO app only supports mainland China mobile numbers… Our app wizards are working to change this for our users in Hong Kong, but in the meantime you can try downloading the global English version! the ui is simplfied chinese. Hi Krystal Right now, the China FOREO app only supports mainland China mobile numbers… We are working to publish a Hong Kong version, but in the meantime you can try downloading the global English version! I just i the app but I’m having trouble linking it to my device. The Bluetooth function seems to be not working. Hi Vanessa! Sorry to hear you’re having trouble. 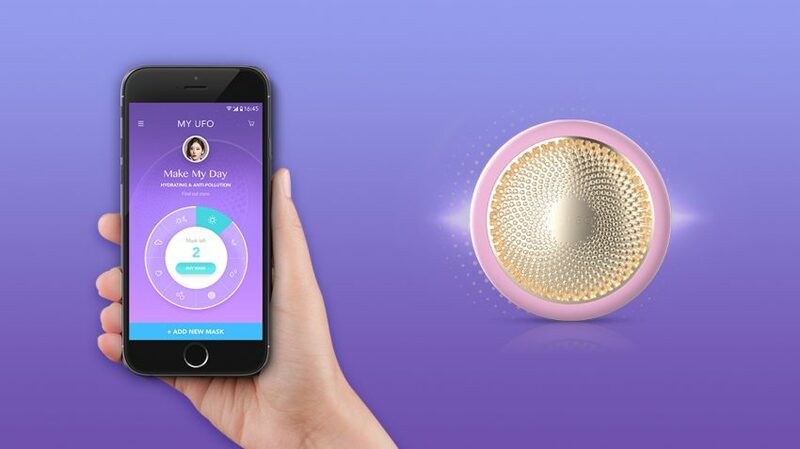 You’ll need to make sure Bluetooth on your phone is turned on, then open the FOREO app and select ‘My UFO’. Turn on your UFO – a blinking white light means UFO is in pairing mode – and it should automatically connect! You’ll know UFO has been successfully paired when the ring of white LED lights is no longer blinking. How can I use the LED lights function using the app? We’ve created UFO smart mask treatments with the optimal temperature, pulsation intensity, and LED wavelength for each UFO Activated Mask formula. So, all you have to do is select your preferred treatment in the app, and it will automatically sync to your UFO device! I got my UFO and plugged it in and it immediately started vibrating. It vibrated for 2 hours and then died. No amount of pressing the button would turn it off or holding the button. When it died I tried to press the button again and nothing happened so I re plugged it in and immediately it started vibrating again. I haven’t been able to use it because of this glitch and I can’t get through to customer service because the Australian number is not a real number. This is very stressful. Something is obviously wrong with my UFO. Can you please provide some assistance and help? Is it only red-light mode available? Hi Noris, the Call It a Night treatment incorporates red LED light throughout the 90-second routine! How do i customize the treatment settings to skip the warm cycle for example? I can not download the application. No one support me. I am so sad. Hi Tina! So sorry to hear you’re having trouble downloading the app. It’s now available to download on the App Store & Google Play. If you’re still having trouble, you can contact FOREO customer care here. I can’t pair my UFO with my phone. The UFO alternates between flashing and constant light while my phone tells me “please wait” for over 15 minutes. What am I doing wrong? Hey Evelyne 🙂 A solid white light means your UFO has successfully paired! The flashing light indicates UFO is in pairing mode. If in doubt, try turning off your UFO, and closing the FOREO app. Make sure Bluetooth is enabled on your phone, then restart the app and turn UFO on. Hope this helps! How do I change which light color I want to use, it always defaults to the red light (warm) setting. I would like to know how to use the cryotherapy feature please. Cryo-Therapy will be incorporated in several of our soon-to-be-released mask formulas, so keep an eye out! Be sure to turn on the Bluetooth function on your phone to ensure your device is synced to the app. If you are still having trouble feel free to reach out to customercare-emea@foreo.com! Im in Canada and I downloaded the foreo app but it doesn’t have an ufo option. I can’t pair my ufo to my phone. In order to sync the app with UFO make sure your device is on and in pairing mode and that you have Bluetooth activated on your phone. If you’re still having trouble, feel free to get in touch with our customer service at customercare-usa@foreo.com. When the light is flashing on the device, this means UFO is in pairing mode. To set up your UFO, turn on the Bluetooth function on your phone and then open the FOREO app and follow the instructions to sync your phone with your device. If you have any further questions, feel free to reach out to our customer support line at customercare-usa@foreo.com. Hello, I downloaded the app and for the past two days it’s been showing this error (see below), even though I have Internet connection. I even rebooted the router and the phone several times just in case but it is not an Internet problem for sure. Sorry to hear that you are having trouble setting up your device. Please reach out to customercare-usa@foreo.com so they may resolve this issue and help you enjoy all the benefits of UFO! The barcodes on my masks continue to be “invalid”. Every one I’ve tried to use is invalid. How can this be? There needs to be a way to enter them in by hand or override the system. The UFO is useless if the barcode doesn’t scan because it doesn’t start. Is there a way to use it manually??? Hi Linda! Have you scanned the box barcode or the sachet barcode? Either should work, but give them both a go. You can start the Make My Day treatment manually by pressing the universal button twice (once to turn on, and once to activate), which will illuminate 1 pink LED. You can start Call It a Night by pressing the button three times, which will illuminate 2 pink LEDs. Hope this helps! I just received the ufo mask do I need to charge it first or does it arrive pre charged? I really do not need the blue light function is this something I can control if so how? Lastly, If I am using the app do I need to scan the mask box every time so it know what mask I am using? When you first receive the device, it should be ready for use, however to be safe we advise plugging it in to charge for 2.5 hours for a full-charge. The blue LED light function was designed to be paired with our future mask collections – so stay tuned for more information on which masks treatments use blue LED light. For now, the Make My Day and Call It a Night masks do not feature blue LED light. When using the app, you only need to scan the barcode on the mask the first time you use a new mask. The mask box will automatically sync with your FOREO app to unlock your UFO corresponding treatment routine! Hi, the Kickstarter campaign comments from Foreo said the UFO would be designed so that it could be used standalone as light treatment or heat/cold treatment. For example, I bought it to use the blue LED for acne now, not to have to wait till some mask what may not be suited to my skin that happens to use blue LED finally makes its way to the shelves! But now the commentry above says all settings are mask specific. Are you saying the Kickstarter campaign commentry straight from the developer isn’t correct? That means the campaign was very misleading! Can you please clarify what the plans for the UFO are? Hi, I downloaded the app onto my google pixel but it doesn’t give me the option to track my usage or set up any reminders. On my screen, I only see two icons , the day mask and the night mask, but all the other sections are blank. Thank you so much! Love these masks! Hey Alina 🙂 Currently, there are only 2 UFO Activated Masks available – Make My Day & Call It a Night. The other blank sections you see are for the new masks – launching very soon! I tried connect my Foreo product to the app. I turned on the Bluetooth and pressed the button until it blinked and it just blinks and then stops, but never connects to the app. Hi Jennifer! To successfully connect the device with the app, please kindly turn on the Bluetooth, then turn on the app and stay at the home screen of the app, where you can see the “connect” option on the bottom of the screen. Then press and hold the on button of the device for 3 seconds. The device’s led light on the back of the device should then start blinking and the device should get automatically connected to the app. If this does not help, please try reinstalling your app as the application is still in the beta mode and it’s going thru updates constantly. Also, make sure you are using the newest version of the software on your mobile. Hi, I have no problem to pair my smart phone and my UFO, but the scan function doesn’t work. I mean a have an app with QR reading that works very well on my smart phone(so the problem doesn’t come from the IPhone) but the scan into the UFO application doesn’t work. Can you please advise how to sole this issue ? Just received my Luna fofo from fabfitfun. Excited to use and downloaded the app. It’s still in Chinese. I read earlier comments/responses from April stating that you expected an English version any day. It’s the middle of June. Am I missing how to change it to English or is this app still not useful for me? Hi, I cannot register my UFO – I see on the app “Register” space, but when I click on it, nothing happens. How can I register my device then? I can not connect my Ufo device to the app. After going through the process off connecting the full white light appears on the device, but the app still shows “please wait…”. Hi JP, please try restarting your phone, Bluetooth, and the device (by pressing the power button once). Make sure your phone has a stable internet connection Bluetooth and Location services are on. Once you get to the connect page, press and hold the power button for 3 seconds. The device should connect easily! Have an iPhone 8, downloaded the app. Recently purchased a foreo ufo device. press and hold the button…no flashing, nothing. Any suggestions? Hi, Deb! We would like to suggest you restarting your phone, Bluetooth, and the device (by pressing the power button once). Make sure your phone has a stable internet connection Bluetooth and Location services are on. Once you get to the connect page, press and hold the power button for 3 seconds. The device should connect easily :-)! My UFO is blinking, but remains unpaired with the app and I cannot use it. I’ve closed it down, switched on and off bluetooth.. Please contact our team at customercare-emea@foreo.com and the colleagues will assist you as soon as possible! I bought the UFO from Sephora app delivered to Philippines. I just finished downloading the Foreo App but I can’t add the Glow Addict mask I bought with it. Hi, Elle! You need to scan the code on mask then the different mode will be added to your APP! Hello, Pippa! Your UFO is automatically registered to your Foreo account as soon as you connect it to the application. Suddenly my app cannot connect to my Foreo UFO. I tried to reinstall the app but still the same. On the app keep saying “press and hold the button for 5 seconds”. Hi, Dee! Please contact our Customer Care team and our colleagues will assist you as soon as possible! I was curious as to whether or not you’re able to add multiple masks onto the app at one time as I see that on the foreo ufo page on the site there is a photo that displays the app and it says, “Mask left 2”. Is this possible?? Thank you! Hi, Cara! Please contact our Customer Care team and they will do their best to help you as soon as possible. I do not have a smartphone. If i use the manual start does this limit the variety of lights and pulsations that the device will provide? would the cryo setting work if i start manually? thanks. Hi, how do I register the warranty for UFO? There was no magnetic card in the package which I received. The deivice is purchased in Singapore. Hello, Giselle, please contact our Customer Care team and they will provide you all the necessary information about the registration. I bought different masks and can’t download the settings for them on the app. Please give detailed instruction how to do it. Thank you.